Here's something the folks at Disney can take real pride in: "The Lion King" is the top ticket of all time. With a worldwide gross of over $6.2 billion, "The Lion King" stage musical has now achieved the most successful box office total of any work in any media in entertainment history, The Associated Press has learned. The show quietly took over top spot from the $6 billion-earning "The Phantom of the Opera" late this summer, according to representatives from both shows. "Phantom" producers Cameron Mackintosh and The Really Useful Group congratulated "The Lion King" in a statement, calling their rival show "The Pride of Broadway." The total makes "The Lion King" more valuable than any single Harry Potter film, the blockbuster "Titanic," or any of the "Star Wars" movies. By way of comparison, the highest-grossing film in history is "Avatar," with nearly $2.8 billion worldwide. "It's difficult not to become emotional at this realization of the show's impact," said Thomas Schumacher, president and producer at Disney Theatrical Productions. He recalled the long road the musical has taken from its beginning in four downtown rehearsal rooms in May 1997. "Our goal then was to tell the story purely and theatrically so that audiences could feel it in their heart," he added. "And, to this day, that is the audience experience whether they see the show in Madrid; Appleton, Wisconsin; South Africa; Tokyo or Broadway. Of that, we are deeply proud." The figure only calculates box office receipts from the various worldwide stage productions, not sales of posters or CDs and other merchandise, revenue from the film, which grossed $423 million domestically, including its rereleased in 3D, or syndication and licensing fees. Currently, there are 10 productions of "The Lion King," including those in New York, London, in Hamburg, Germany, and on tour across North America. There's no need to cry for "The Phantom of the Opera." It's still the longest-running show in Broadway history and 140 million worldwide have seen it. There are currently eight productions with new ones planned for Moscow, Hong Kong and Istanbul. "The Lion King," which features music by Elton John and lyrics by Tim Rice and the vision of director Julie Taymor, was an adaption of an animated film when it hit the stage but has in many ways overshadowed the film. It tells the story of a young lion cub's coming of age and uses puppetry and dance in ways that haven't been replicated. It was the highest grossing Broadway show last year and is the highest-grossing production so far this year, despite rival shows in five bigger theaters and musicals like "The Book of Mormon" often charging hundreds of dollars more per ticket. Part of its longevity is due to its movie tie-in, simple-to-understand story, family friendly themes and the fact that it's a spectacle not dependent on big-name stars. Twenty-two global productions have been seen by more than 75 million people. 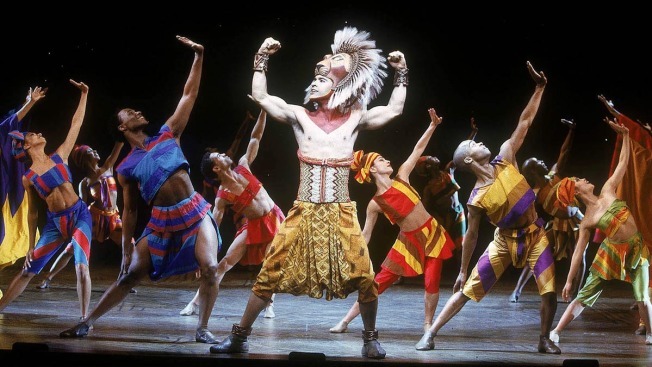 "The Lion King" chased down the overall box office crown despite "Phantom" having a big head start: Disney's show began on Broadway in 1997, while "Phantom" debuted onstage in 1986 in London. "It's the distance runner, it's the marathon runner. It's taken 17 years of legitimacy to get there," said David Schrader, executive vice president and managing director at Disney Theatrical Group. What makes the achievement all the more remarkable is that Disney executives haven't gouged every last cent from the public. In fact, they've purposely left money on the table. Last week, for example, the average ticket price at "The Lion King" was $128, while "The Book of Mormon" was $50 more. And while top premium tickets for "The Book of Mormon" was $477 and $300 for "Wicked," the highest price at "The Lion King" was $197.50, illustrating a conscious attempt to keep even the best seats in the house under $200. "We're never going to be the top price. We're never going to have the highest VIP price. We're never going to have the highest orchestra price," said Schrader "We're not in this for tomorrow afternoon. We're in it for however many years we've got. We're trying to be moderate." The other half of the equation — attendance — is also strong. It has increased four of the last five years on Broadway, the London production has seen a 6 percent increase in attendance over the last five years, and the latest North American tour has seen an 11 percent increase over the same period. Both "Phantom" and "The Lion King" have benefited from the emergence of premium — or dynamic — pricing, although the Disney musical has obviously enjoyed more seasons using the tactic. It involves increasing or decreasing prices for certain seats depending on demand and started with the 2001 musical "The Producers," which set a precedent with $480 tickets. At the mother ship in New York, Schrader said the Broadway audience is made up of four key groups in roughly equal proportions: Manhattan residents, commuters from the New York, Connecticut and New Jersey, domestic tourists and foreign tourists. "There's no way you get to 17 years without somehow holding all four," he said. Clever advertising — like using digital screens to show crisp images of brightly costumed characters at Pennsylvania Station and the city's airports — and a scrupulous attempt to maintain its high quality onstage mean "The Lion King" hasn't devolved in to a kids' show or a joke. It still attracts a well-heeled crowd, routinely breaks $1 million a week at the 1,700-seat Minskoff Theatre and Disney has been loath to ever discount its tickets. "If anything, the lack of change is what's remarkable," Schrader said. "Everything erodes, everything comes apart. So the fact that it hasn't is curious." Schrader spends much of his days poring over audience data, figuring out demand patterns based on historical trends, school holidays and even weather forecasts. He knows that 6 percent of a Broadway audience is from the Philadelphia metro area. He knows that daylight savings time will "inevitably" mess up schedules. He'll add a ninth performance during a holiday week but balances that with a need to not overtax the cast. "I love puzzles," he says with a smile. But of "The Lion King's remarkable longevity and continued potency, Schrader is modest about how much effect he has. "I wish we could take credit, but it's the audience and it's the word-of-mouth that's driving it."